We hear you, and we don’t blame you. Climbing the ranks of the search engine ladder has long been a focus for businesses who are savvy with their marketing goals. Getting traditional leads through the door is already a challenge, but dominating the online space and being heard above the plethora of competition is a whole other ball game. Enter search engine optimisation. You’ve probably heard the term ‘SEO’ thrown around here and there, mostly used by techies and marketers who have decided to pull out the big guns and get serious about digital tactics. In a nutshell, SEO stands for ‘search engine optimisation’, and is the approach of getting traffic through to a website by taking advantage of high-volume ‘search queries’ being entered into engines like Google. The users searching for these terms are looking for answers, and businesses who have approached SEO the right way can end up being the solution to their problem. It’s important, however, to understand that SEO is deemed as ‘natural’ or ‘organic’ traffic, because those utilising this method aren’t paying Google or Bing to be at the top of search results (SERPs). Alternatively, businesses can choose to invest money into paid placements, which provides real estate at optimal positions around results returned to users. You’ll find these in the format of ‘ad’ results, which commonly appear at the top and bottom of the SERPs. These pages have invested money to be there, opting to pay for each click they get through a system called Google AdWords. SEO, however, is a comprehensive pool of efforts that unite to create a more natural approach – and often a longer-lasting one, too. 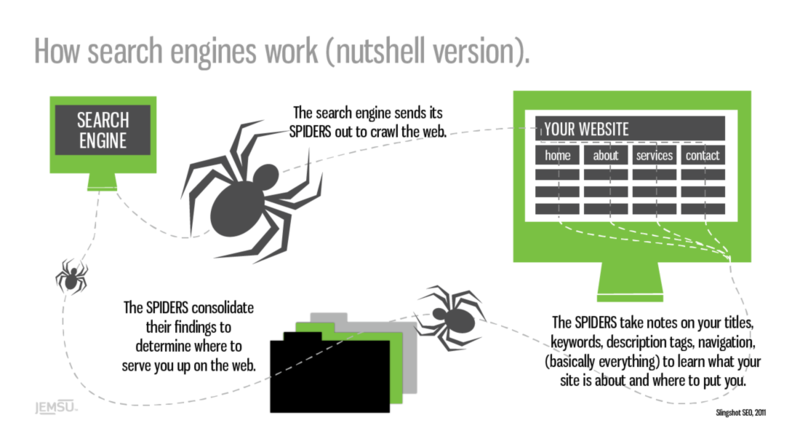 What is SEO made up of? Diving into this field is risky...we could be going down a rabbit hole. But put simply, search engine optimisation relies on quality-driven strategies to attract more traffic through the (virtual) door. These efforts are extremely targeted, focusing on specific audiences and frequently used keywords in searches to get the right eyes on pages. The quality of all traffic coming in: It doesn’t matter if you have hundreds of users flocking to your page a day, they must be relevant and genuinely interested. That means you must be directly tied to the searches that are resulting in the clicks to your page. It’s no good showing up in SERPs for something you do not do or offer. Misleading your audience won’t get you that free traffic you’re after, or if it does, it won’t for long – Google’s crawlers are far too smart to recognise quality over irrelevancy. The quantity of the traffic: While the quality is often prioritised, having massive amounts of users clicking through to your website still tells the likes of Google that you’re important. You’re an authority to your audience, so you’re more likely to be an answer to other users’ search queries too. Given Google has a focus on providing the most accurate, helpful results, its algorithms are likely to favour your site over others because you’ve ‘helped’ out enough people previously. Plenty of visitors are heading over to your page, and there must be a reason why. Technical elements: This is where all the nitty-gritty happens. A strategic line-up of tech-focused techniques help to grab search engine crawlers (the little robots behind the scenes that scan your pages) and tell them to pay attention to your site. From keyword research and implementation, through to content optimisation and comprehensive linking – this part of an SEO strategy is the most critical...and complex. When done poorly or through black-hat techniques (where you cut corners to get results), it can do more harm than good, so it pays to get an expert on the job. Delving into all the granular details of SEO requires an intricate, detailed and jargon-driven explanation. However, when you’re first trying to get your head around the concept as a marketing avenue for your business, you initially need to understand a few core components. Keywords: You can consider these as the lifeblood of any kind of SEO campaign. No strategy is complete with well-researched keyword implementation. This means incorporating the most searched for terms on Google (or Bing and Yahoo!) into your website content and backend. Ultimately, they determine what SERPs your targeted pages will appear in. But it’s also all about balance – keywords need to be carefully and naturally positioned within content on your website, all the while still being targeted enough to pull the right traffic. SEO content writers know how to juggle the two, creating subtle indicators for crawlers to take action on, and still being able to engage and inform the audience at the same time. In the ‘old days’, keyword optimisation in content meant you could splatter them everywhere and anywhere, and hope for the best. These days, Google and its bots are far more stringent – spam them without care and you’ll land in hot water (penalised). Content: Tying in with those good old keywords, content is the fuel behind a healthy SEO campaign. Readability is a key contributor to whether bots deem a page important enough to rank or not. This is why content marketing has become such a massively valuable channel for businesses of all kinds, providing powerful, thoughtful and well-written information for readers, rather than keyword-saturated dribble. Keywords that are fitted into the content should be done so carefully. Ultimately, a reader shouldn’t be able to tell if you’ve even attempted to integrate these terms into your text. When done correctly, you’ll see an improvement in your rankings and visitors who have found answers to their biggest questions. Backlinks: When other websites link back to your own, they form what is called a ‘backlink’. These are valuable to SEO campaigns, as they tell search engines that other websites deem yours as an authority. However, this is also an avenue that’s often abused by black-hat technicians, who may build and spam low-quality links to ‘beef up’ the number of them overall. Just like traffic and content, backlinks are actually assessed on their relevance, quality and overall position in the content, so not giving enough attention to these areas can prevent you from reaping the benefits. Traffic: Like we said before, web traffic plays a big role in just how well a page ranks. Algorithms typically incorporates data like visitors to your site, those that return back to it, clicks (CTR) and bounce rates. However, these are only a few of many, and the importance of each differs as algorithms chop and change focus. Accessibility and user experience: Sites that don’t offer visitors a valuable experience aren’t sites worth ranking. This also ties heavily into traffic, but you’ll find the better your website journey for your audience, the better your overall analytics. Provide users with a seamless, easy-to-navigate experience across your pages, and you’ll likely gain more conversions, too. Load times and speed: No one likes dial-up loading speeds. You can’t get those viral cat GIFs on demand if the page is taking its sweet time to load. As user behaviour comes more demanding, and attention spans become shorter, having a fast-loading website is another way to increase search rankings. Security: Google is placing more emphasis on secure websites than ever before. Offering visitors safe access to your site (usually through HTTP and not HTTPS) lets bots know you’re credible and legitimate. Google usually won’t index insecure websites, or if they happen to slip through to SERPs, they’ll be marked as potentially unsafe to users who click through. You don’t want your website to be one of them. One of the biggest misconceptions from those looking to undertake SEO is that you can instantly rank for certain keywords and stay there. Google’s algorithms mean the focus on different aspects of an SEO strategy constantly fluctuates and shifts. One month, there may be a heavy emphasis on longer content word counts, while another month may see a need for more strategic internal linking. The nature of this marketing channel means it requires an on-hand expert who can monitor and adjust campaigns as they progress. No SEO strategy should sit stagnant; one that hasn’t been optimised for the latest algorithm updates means it’s not optimised at all, leading to a waste of time and money. If you’re looking to kickstart your search engine optimisation efforts, get in touch with an expert on 1300 367 009.